As the woman who truly can do no wrong, the queen of RnB shines on the Beyonce InStyle September 2011 cover. Wearing a Dolce and Gabbana star dress and her million-dollar smile, the superstar lands her second September 2011 cover just a week after her Harper’s Bazaar UK cover was released. Donning Dior and Roberto Cavalli, among many other A-list designers, Beyonce manages to pull off each look with ease and sophistication in the editorial shoot. 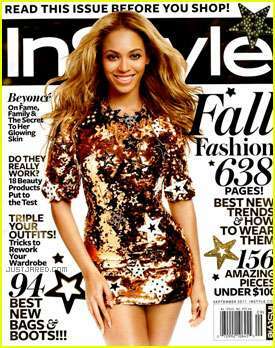 The Beyonce InStyle September 2011 cover showcases one of Dolce and Gabbana’s star dresses that have made quite a splash on Hollywood red carpets this season. The Beyonce InStyle September 2011 issue also delves into Mrs. Jay-Z’s love for her girlfriends. "I am a girl’s girl. Women who don’t have female friends scare me. I love my friends, and I love sitting with them and listening to their stories," says Beyonce.